Just like vitamin intake, it's critical that humans ingest a regular serving of incredible or inane animal videos. It's a scientific fact along the lines of birds actually dancing to the beat (which appears to be a bonafide fact). Thus, it only seems apropos to kick off a holiday weekend with Kiki- a bird as talented as I suppose birds can be. Kiki is a parrot, who has been trained to fetch a yellow 2x4 LEGO plate. You will be mesmerized by Kiki's ability to scamper across the white-tiled floor with a LEGO plate in her beak. Our dog also likes to fetch LEGO bricks; however, unlike Kiki she enjoys chewing and reshaping them. In my heart, I suspect Kiki is just waiting for her owner to throw a valuable minifig or rare piece, which she will then set upon like a tiny bird wolf pack. 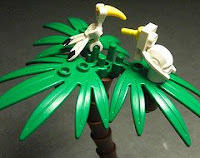 But if Kiki is truly good-hearted, perhaps she could get a job at LEGOLAND as a brick parrot, fetching bricks for the Master Model Builders as a replacement to the traditional brick monkey.